Once you clean off your tires, then you can use a gel cleaner to spread over your tire and wipe down the tread. This will give you a deeper clean, but you need to make sure that you rinse off the cleaner as instructed. 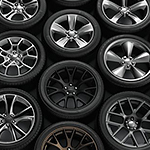 You don’t want to leave cleaner on your tires as it can damage the rubber. If you’re ready for the next level in a car wash, why not try the service department at Lithia Reno Subaru? You’ll get the best clean available with their team.